This is such an adorable party theme! I have seen these pics featured on several other websites so far and just love every single aspect of your party! The cake is so cute, I love the brown & white colors and the milk jars are such a special touch! Congrats with having your party featured, you are so creative! Seriously, this party was absolutely amazing. To say I loved it is an understatement! The details are amazing! Love, love, love! The plates are such an amazing idea, especially since I just recently discovered gel food coloring! I will definitely have to try that! how beautiful! i love this party theme! i need to do one of these parties, soon! i will definately feature this party on my blog! What a fantastic idea! And a perfect way to celebrate a birthday (I am totally stealing this idea)...can't wait to see what you come up with when Aubrey turns two! What a great party! Thank you SO much for the idea of looking for bottles at Ikea. 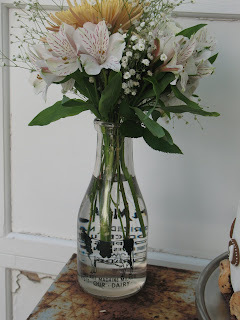 I am always scouring antique stores looking for milk bottles to use as vases in my projects, which gets pricey. Love the plate stamping. So clever. I am in awe at the gorgeous details that went into this party. Love everything you did! Wow, you are a party diva! This was totally cool, and someday I'm going to have an excuse to use the stamped plates idea! Could you share with me how you made the brown labels? Did you order them? Thanks, I'm simply in love with this idea and all of your details! Just wanted to thank you for this idea. I just used the theme for a bridal shower and it was such a hit! I hope you don't mind that I linked to this post in order to give you credit for the great idea. Thanks again! Beautiful party!!! Adorable!! Loved that you gave us all the inside details. I might use some of it for my baby boy's 1st birthday coming up in August!Thanks!! I love this! It is adorable-and your tutorial is awesome. What a PRECIOUS party! I am using all of your amazing ideas for a baby sprinkle I'm throwing next month. But I wanted to add an idea my mom came up with for the perfect favor. She suggested making the cookie-in-a-jar (where you layer all of the ingredients for a certain type of cookie in a Mason jar) with a label as a favor. Love that idea too! Thanks for sharing! The straws were a lucky find in the clearance bin at Joann Fabrics. Unfortunately, I doubt they have them anymore. And to everyone else, thanks for your continuing compliements. You sure do know how to make a girl feel good! This party has taken on a life of it's own! I love it! I LOOOOOOOOVE this theme!! Great job!!! I have always wanted to do a "milk-n-cookies" theme. Your set-up is oh so divine ~ I love the details! Beautifully done Anne. what an amazing party idea! how did you make the wrap around labels for the invitation? I featured your post on my new blog! Hope you like it! You did a great job!! I'm new to the blogging world, but stumbled across yours when I was trying to find a cute idea for my daughter's First Birthday. You have inspired me to take on the "Milk and Cookies" theme! It is in October, but I'll be sure to send pictures your way. Thank you for the pictures and instructions! wow! I love love love this party idea! I have been racking my brain for a creative first birthday idea. What was the wording on your invitations? Im sure you had some adorable wording and would love to hear it! Anonymous - The wrap around labels for the invitations are actually 2 pre-bought labels from Paper-Source. I cut one in half for the return address on the back and for the front, I just cut off the border on one end so it looked like it went on around. Lorena - thanks so much for the feature! And best of luck with your new blog. ADayInTheLife - Thanks, you're too sweet. PLEASE do send photos; I would love to see your party. I'm still waiting on several others to send me theirs. Anonymous - If you click on the picture of the invitation, it will enlarge it so you can read the wording. It was pretty ordinary, but did do a couple of word plays. For the timing of the party, I put "bake time" and for the where, I put "our oven" followed by our address. Hope this helps! I'm doing this for my daughter's 1st birthday in October. I'm wondering what kind of food you served to your guest? Your party was amazing and your little one is gorgeous! Celebrating the first birthday of your child is one of the milestones in a parent's life. Especially when you have such a cute baby as your daughter. There is a cute store just blocks away from tent rentals, Bay area . It has a lot of stuff that you need for special occasions like these. Hey Anne! I'd love to imitate this for my son's second birthday. I love the cake! And those bottles are so cute (as well as your daughter). We'll be inviting the whole family, so we decided to hold it in a ballroom. Most of my cousins from Denver, CO have children so the room will be filled toddlers! I'm so excited. Thanks for this idea. Btw, how's Aubrey's birthday for this year? Thank you so much:) I am in the middle of trying to get a "Milk and Cookies" baby shower together and I am working on the invites/lables right now. I know I am late (about a year) but I just came across this post. Fabulous party idea! This is just way too cute! I love the idea and gonna use it for my next party. 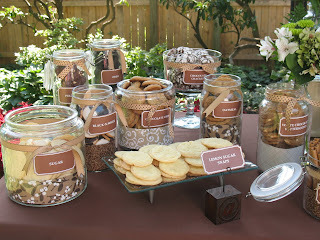 wow..what a theme that milk and cookies party..
i like only those parties which has some specific theme.. I just discovered this post -- and thereby your blog -- via Pinterest today. This is probably the cutest party idea I've seen in a long time. The question I have, is where did you get the following things: the wide-mouth jars you put the cookies in (primarily the four in the front row of that photo) and the pitchers used for the water and tea? I love them all. Great job! I have collected those wide-mouth jars at places like Target, Ikea and Wal-Mart. The pitchers for the water and tea were from Crate and Barrel years ago. I don't know if they are still available??? Hope this helps. LOVE THIS! Very cute and creative. This was a really good post. In idea I would like to put in writing like this additionally — spending time and real effort to create a excellent article. This party is so amazing! What a great idea! How did you make the cookies on top of the cake???? Wow, this is fantastic!!! I love the cake :) A perfect theme for kids party. BEAUTIFUL PARTY!!! We are going to try something similar for my son in March. Can you tell me where you purchased your cake stand and what size it is? It’s hard to find knowledgeable people on this topic, however you sound like you know what you’re talking about. This is such an adorable party theme! Congratulations for your successful party. mmm this makes me want some milk and cookies! Adorable! Can't wait to see more. she's so adorable! did you make all of the designs for her party? love this party theme, I plan on doing it for my daughters 2nd birthday in 2 months. I have been stocking up on starbucks bottles and recently found out how to easily take off all the sticky stuff! Cover the sticky area with peanut butter, let it sit for 15 minutes, then scrub off! Takes off everything! Pretty good post. I just stumbled upon your blog and wanted to say that I’ve really enjoyed reading your blog posts. In any case I’ll be subscribing to your feed and I hope you post again soon. This website has very good content. Please let me know if you're looking for a article author for your weblog. So I am sure this website will form the well-known in the future. Someone I work with visits your blog regularly and recommended it to me to read also. The writing style is great and the content is top-notch. Thanks for the insight you provide the readers! A really great content. You then have a very useful post here as well as I just needed to thoughts & thanks a lot regarding submitting this particular. I’ve bookmarked your blog as well as I’ll be back to go through a lot more sometime soon my mate! Furthermore great colorings within the layout, it’s very easy within the eye. Please let me know if you're looking for a article author for your weblog. You have some really great posts and I feel I would be a good asset. If you ever want to take some of the load off, I'd love to write some material for your blog in exchange for a link back to mine. Please shoot me an email if interested. Simply want to point out the write-up will be impressive. The understanding in your post is merely impressive and also i can take for granted you might be an expert on this issue. I just now came across the webpage and also Absolutely insightful new data thank you a ton. I'm sure we would all love to go through far more useful intel much like this specific in the future I truly confidence you really can simply continue your overall abundant writing type. Just wanted to thank you for this idea. Awesome post! Personally I like your site. . I am so impressed to read your content. Kami jual berbagai macam aksesories pelengkap hubungan di atas ranjang pasutri yang akan meningkatkan keharmonisan hubungan suami istri, Buat anda yang sudah berpasangan atau sudah dewasa skedar ingin tahu seperti apa bentuk acsecories pasutri itu silahkan anda buka alamat urel situs www.kencanapasutri.com di sana anda akan menemukan banyak berbagai macam acesories yang dapat di gunakan untuk membantu meningkatkan rangsangan sekaligus memberikan kepuasan di atas ranjang. Buat kalangan umur dewasa yang belum mempunyai pasangan juga dapat memanfaatkanya untuk membantu onani / masturbasi sehingga bisa lebih memberikan kenikmatan. Love to attain this type of Party....Thanks for sharing it!!! Nice Blog keep sharing more information about furniture. I was seeing lots of food menu but this is one of the best, this blog is looking repository of food I am very happy to see your blog and its menu with information. I just appreciate you for that kind of effort. Thanks and share always new and delicious items. Many thanks again for a lovely evening. You and your staff were all so accommodating and helpful. The venue, atmosphere, music, good food and helpful staff all contributed to a splendid evening. We are on a daily basis still getting great feedback from many of the 500 clients who attended. Please convey our thanks and appreciation to each of your staff. This recipe is terrible because it uses best ingredient for making the superb food, I can feel it how much tasty is this. I just glad after seeing your efforts please share more delicious item. Impressive article,i delighted to visit here and to discover this amazing article.Thanks for share this with us.